The Red Storm use an early blitz to keep their perfect record intact and end Cheverus' nine-game winning streak. 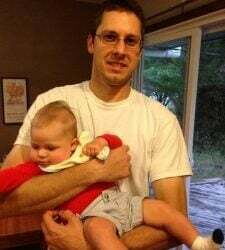 SCARBOROUGH — How better to serve notice to a talented visiting team with upset aspirations than to take them out of the game early? 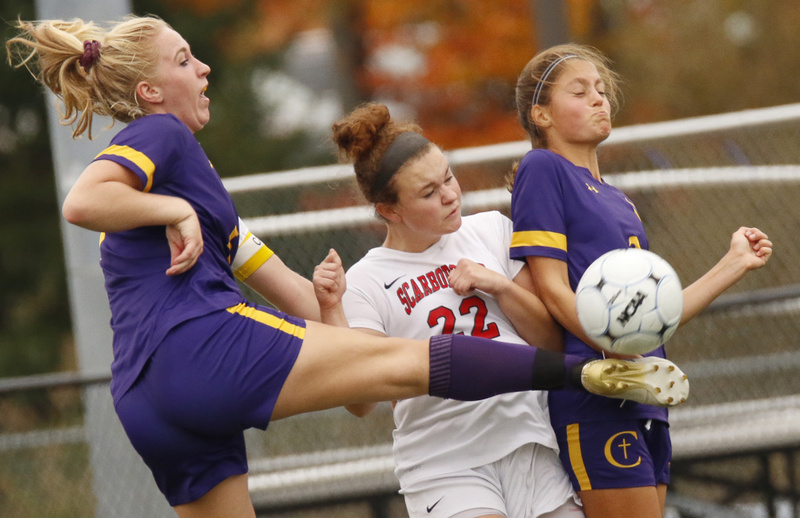 The Cheverus girls’ soccer carried a nine-game winning streak into its match Saturday afternoon against undefeated Scarborough, the top-ranked team in Class A South. Despite having a young starting lineup with two freshmen and three sophomores, the Stags felt they could go toe-to-toe with the Red Storm. 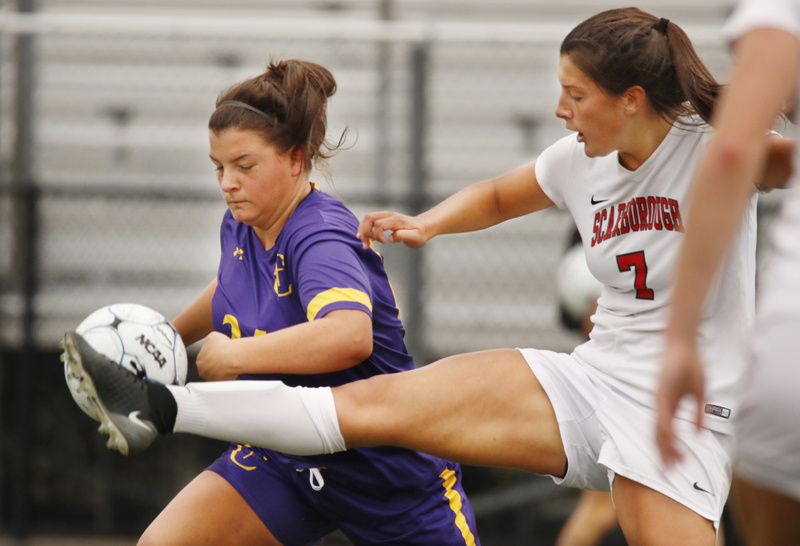 Scarborough, though, erased any thoughts of an upset by scoring twice in the first four minutes as it cruised to a 3-0 victory. The Red Storm improved to 11-0, having outscored its opponents 57-4. Cheverus is 9-2. “It was really important (to get early goals),” said Scarborough junior right wing Molly Murnane, who paced her team with a goal and assist. “I am glad we could work together (early) after our last game, when we waited until the last minutes to score. 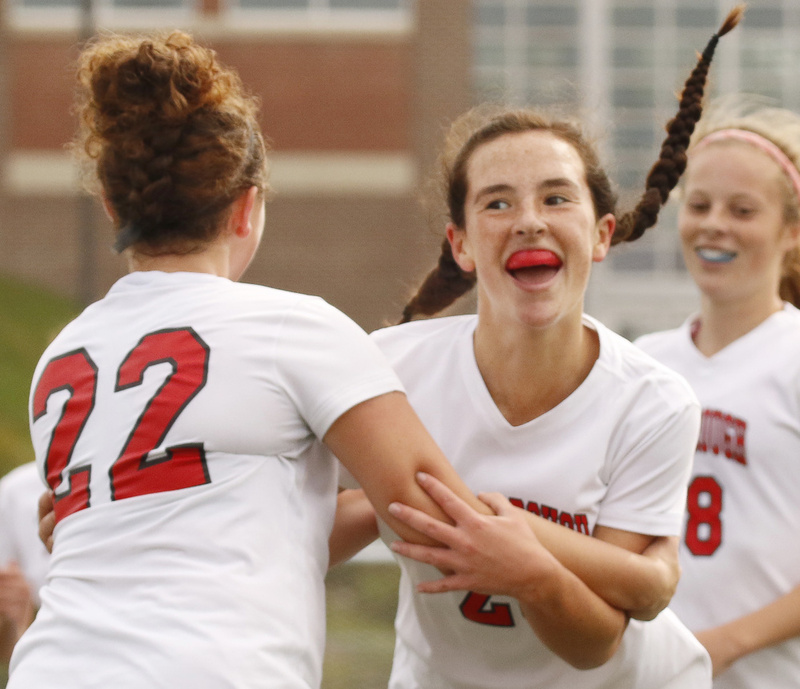 Murnane, a transfer from Maryland, scored twice Wednesday in the final 4 minutes, 11 seconds as Scarborough escaped with a 2-0 win over Noble. Against Cheverus, Sophia Martens got Scarborough on the board 1:24 into the game. Her free kick from just outside the penalty box on the right wing was perfectly placed, finding the far top corner over Cheverus keeper Neve Cawley (six saves). Cawley, a freshman, came out to knock the ball away from Red Storm players in the box but saw the ball go over her head. A little more than two minutes, later Murnane found a streaking Gabby Panagakos on the left wing with a through pass, and Panagakos one-timed into the far corner for a 2-0 lead. 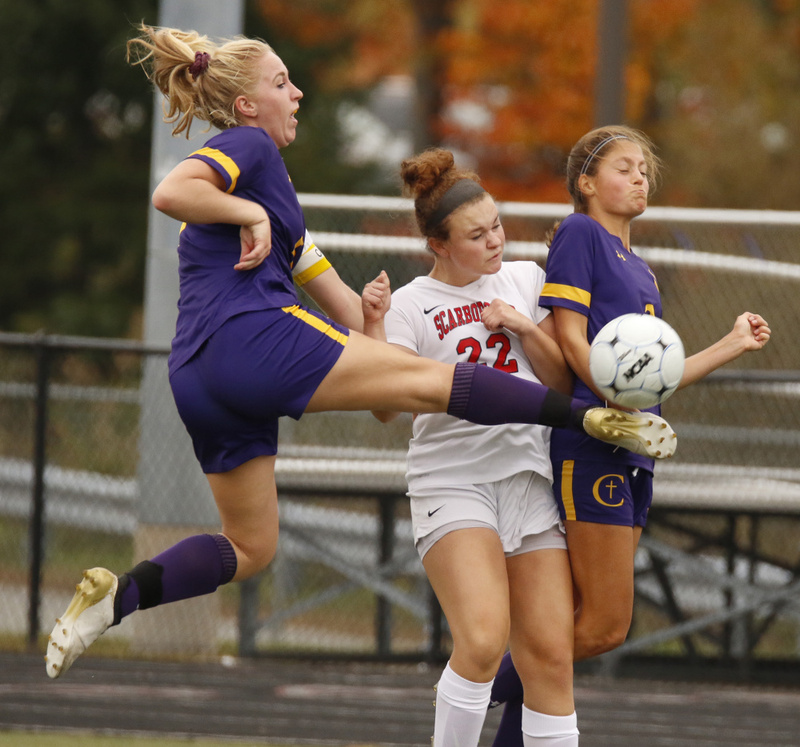 “The first five minutes, we (had) a couple young players in a big situation and they knew it,” Cheverus Coach Craig Roberts said. “There were some nerves there at the start. The Stags regrouped and started to get pressure on Red Storm keeper Emily Royce (four saves) in the middle of the first half, as Emma Gallant and Lauren Jordan had quality shots. Scarborough regained control in the final 10 minutes of the half, though, and made it 3-0 with 7:35 remaining. Murnane dribbled past her defender down the right wing and launched a cross that Cawley again seemed to misjudge, and the ball fell inside the far post. Despite its lofty record, the Stags are in fifth place in the Class A Heal point standings. Scarborough Coach Mike Farley knew that Cheverus saw this game as a great opportunity to prove itself and move up. 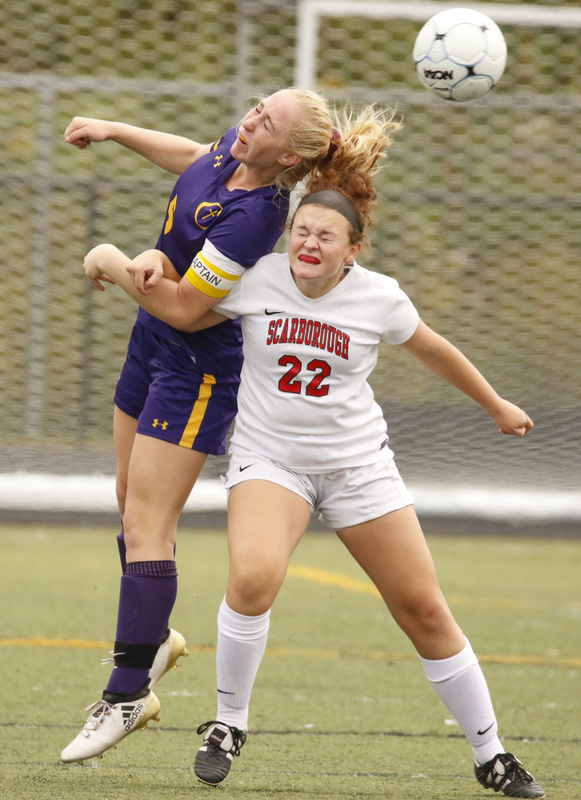 Scarborough’s back line of Haley Koukos, Ellie Patten, Sophie Glidden and Martens limited Gallant’s chances, and Cheverus didn’t have any dangerous scoring opportunities as the Red Storm secured their eighth shutout. UPDATE: This story was corrected on Oct. 9 at 10:05 a.m. to correct Scarborough High’s scoring margin this season.